Here’s an £800 machine that’ll give you decent frame rates in games running at 4K resolution. “Wow, that’s quite cheap!” You all say, in perfect unison. Well, you’re as correct as you are terrifying. Looking to upgrade some hardware? Check out our best gaming mouse guide. There are those who harbour the belief that the definition of ‘4K gaming’ is actually holding a stable 60FPS at 4K, and those people will no doubt take issue with the above benchmarks. It’s worth reiterating the price you’re paying for those performances, though. Achieving the mythical 4K/60FPS requires a serious financial investment, and almost certainly multiple GPUs running in SLI/Crossfire. 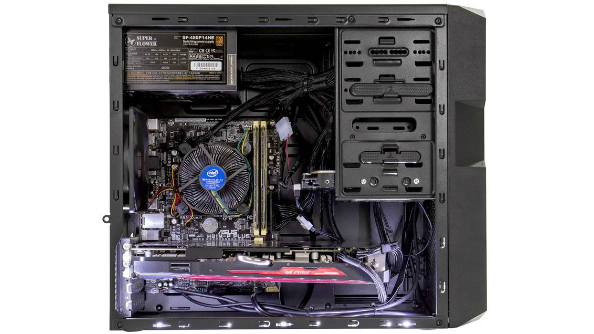 The cheapest version of the build comes with an Intel Core i5 4460 CPU, 8GB DDR3 RAM, 1TB of SSHD storage and anAsus Radeon R9 390X 8GB graphics card, with optional component/storage/case upgrades available for a higher build cost. It’s available to purchase, customise, or simply ogle, over at Overclockers UK’s offical site.